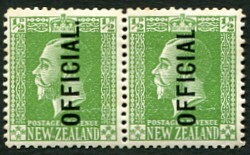 With the exception of the 3s 0d value, the surface printed stamps were overprinted OFFICIAL at the Government Printing Office, Wellington. The 1½d from the local print was issued overprinted in June 1916 while stamps from the Perkins Bacon surface printed plate were issued overprinted in December 1916. The stamps from the local plate are cruder and the lines in the King's neck are diagonal while they are horizontal in the Perkins Bacon plates. The surface-printed twopence was issued overprinted in April 1917, the orange-brown 1½d in April 1919 and the 3d in November 1919. The 1d stamp was issued with George V in the uniform of a Field Marshall was overprinted in January 1927 and issued in February 1927 while the two shilling with George V in the uniform of an Admiral of the Fleet was overprinted in May 1927, but not issued until February 1928. In 1924, the ½d and 3d values on Jones paper were issued overprinted. Stamps were issued overprinted: ½d in 1925, 1d Field Marshall in 1927, 1½d in 1934 and 3d in August 1925. Stamps were issued overprinted: ½d in 1929, 1d Field Marshall in 1927, 1½d in September 1929, 2d in 1931, 3d in 1930 and 2s in February 1928. The overprinting was initially by means of stereos that had originally been used in 1908 and was later used with the KEVII values. In position R5/7 of the 1908 stereos, the tops of the letters OFFIC are shaved off as can be seen in the example of the 2d on the left. The 1908 stereos were replaced by a new set of stereos in July 1918, but they quickly became worn and were replaced by electros. 1½d and 2d examples of worn 1918 stereos with air bubbles are shown on the right. A 1½d example of the 1919 electro on De La Rue paper is shown on the left. In June 1929, a new set of electros was introduced replacing the 1919 electros which were now worn. With the new electros, the letters were thinner and the difference can be seen in the examples below. With the new 1929 electros, in Row 5/24 the overprint appeared without the full stop and with a shortened foot to the L (the No stop variety). An example of the ½d in pair with the normal overprint is shown. The damaged electro was replaced in 1934. The ½d on Cowan paper perf 14 first appeared in 1929 overprinted with the old electros and then in June 1929 overprinted with the new electros. The ½d and 1½d did not appear on Cowan paper perf 14x15 with the new electros until 1934 and the sheets did not contain the No stop variety. This no stop variety exists perf 14 with all the pence values and, in the case of the 3d, it exists perf 14x15 as well as perf 14. There were two ½d plates: numbered 28 and 29 although the numbers do not appear on the printed sheets. The top row of plate 28 became very worn. White patches appeared and when the plates were overinked virtually all the detail disappeared. This became so bad that in some of the sheets overprinted Official the top row was removed and other stamps patched in. 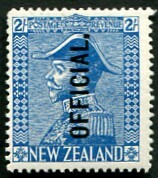 The above information is taken from The Postage Stamps of New Zealand Vol 1, published by the Royal Philatelic Society of New Zealand in 1938. All scans were made by the author.